Leader of the Silverwings militia. The Silverwings Militia is a group of commoners/rejects of the imperial army/people who got thrown out of the army, that wish to serve the empire in a more unofficial way. They all strive to further the range of the empire's rule and is a huge part of the unofficial espionage teams and diplomats. In times of war the Silverwings militia will help the empirial army fighting. Simon grew up within the walls of the imperial city, his wings had a silvery shine to them, which from a young age gave him the nickname Silverwings. When he reached the age from which he could enroll in the army, and decided to do so. He wasn't sure why, but he felt compelled to do it. In the army he turned out to be a super soldier. He was good at most things, and quickly climbed the ranks, eventually reaching the rank of silver knight. At some point however, he decided to break some rules by letting in people whom would normally be scooped away. When it was discovered that it was him whom did this he could thrown out of the Silver knights. Still tantalizingly loyal to the empire he decided to start a militia movement, this movement would include those that was still loyal to the empire, but was unfit for the army, and official use. In the start it was only Simon and a few of his friends. But as they helped out the empire, helped cites and villages they began getting more and more followers. Over the few decades the militia has been around they have gained a big reputation. Simon is getting up in age. And as such is mainly refined to stay in HQ and the capital dealing with paperwork together with his wife. Equipment: Even though Simon is getting older he still wears his slim long sword with him where ever he goes. When in public he wears the common militia armor,(the one seen in the picture) which is made of steel. Simon is a fierce fighter which is shown in his personality. He can be rough and sharp. But he also has a very smooth side to him. He is great with kids and an exceptional moral support. He is well known for his speeches which is said to sent shivers down the spines of his enemies, and ignite the flames within his troops, the sign of a true leader some say. But above all, Simon is a happy old angel. He enjoys his time with his wife and when his kids come visit them. He loves the empire, and is royal to very bone. Elementals are sentient collections of magic energy, that have merged due to hotspots in the real world, or a huge burst of magic from a mage spell. They can't truly interact with the natural world, but control the flow of magic. They are stronger than most races, and strongly linked to magic. Allthough mages can interact with elementals, elementals aren't directly linked to this world. They exist within it, but live in another plane of existence, which is why they can't interact with the world. They seek hosts to let them truly interact with the world they are part of, they are quite picky about their hosts though. While not a race so to say, on its own, an elementis is an Elemental that have taken another race as host. In this case the elemental have taken a human host, most common host type. Elementises live longer than their normal race would, increasing their lifespand by up to 1000%. The elemental helps the host with it's magic abilities, making elemtis mages extremly powerful. If the host doesn't have inept magic abilities, the elemental will make the hosts senses and reflexes stronger. In extremely rare occourences both. The host however becomes weak to poisons and grow a more daring personality as time passes. The host process can begin from the time a potential host reaches the teens. If an elemental finds the potential host to it's liking it will either forcefully possess the host, or ask politely. Once possessed the host remains itself, but finds that part of it's mind is now merged with the elemental. Elementis can be easily identified by the hexagon marks that they have on their body, these can be everywhere. Position: 1st in command of the Silverwings militia. Leader of the first Regiment. His position means that he uses a deal of his time training the recruits, and making sure order is in place. Bio: Arthur was born into a poor family on the edge of the empires borders. He lived the first 10 years of his life doing what boys do. Play with the other boys, tending to his families small farm, helping his farther, and learning various skills. Then one day, his life turned upside down. Orcs raided his village, slaying those that opposed them, and enslaving the rest. Almost the entire village was made slaves over night. That day was the last time he saw his mother. Slaving for the orcs were a tiresome process, they forced the villagers to mine ore for their forges. For 5 years the boy worked hard in the mines, mining the resources his masters needed. Then the orcs decided to step their cruelty up a notch. They began having slave fights. Two or more slaves were put into a ring to fight one another, to the death. In do or die situations Arthur killed his opponents with whatever weapon he was given, fearing for his sisters safety if he failed. Then one dreadful day the worst of all battles took place, he had to fight his father. But his father had other ideas and killed himself. It was about then that he felt the first presence of the elemental that later took his body as host. By this time he was 18, and a skilled fighter. An additional two years went by, Arthur killed whoever he had to, only a few of the original fighters were left, and a ton of new war slaves. It was all to protect his sister. She had recently discovered that she could use magic, which the orcs were less than happy about. The orcs tried to hurt and kill his sister, but using his years in the ring he held them back with a broken sword. It was here that an elemental asked him, in the back of his mind, if he would allow it to use his body as a host. He complied, on the condition that his sister too was safe. Merging with the elemental Arthur was able to beat the orcs, and lead both himself and his sister to safety, far beyond the orcs raidings, as they fled they both changed their last name to Ignis, the apparent name of the elemental that had possessed Arthur, whom he now could communicate slightly with. The two searched protection at the elven king, who complied for a while. Here Arthur futhered his combat skills, but found it considerably easier to train and duel, than most of the elves. His reflexes were sharp and quick, and his movement fast and fluent. Once he and his sister, whom at some point down the line also had allowed an elemental to take her body as host, had regained enough strenght, and Pandora, his sister, had learned the basics of magic, and quickly got better, the two left for the capital of the empire. However they never found themselves comfortable in the somewhat peaceful city, and couldn't join the military for various reasons, mainly that they refused to wear the armor the military required, stubbornly wanting to keep their own clothes. After some time they heard of a group recruting members ready to fight for the empire, but for induviduals that couldn't join the army, for their own reasons. Arthur and Pandora immediately signed up. They quickly rose to the rank, becoming commanders of the militia quickly. They currently use their time sparing with one another, getting a kick out of that. 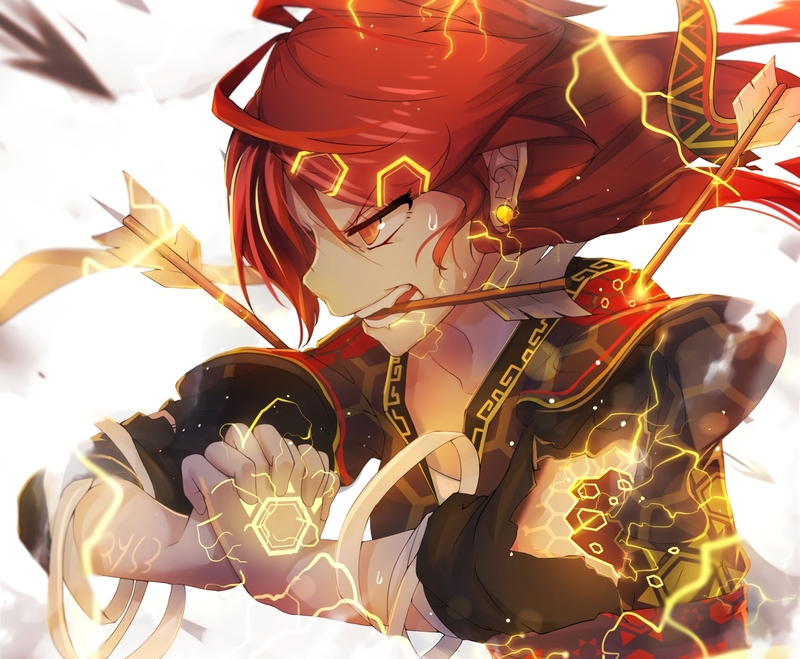 Personality: Being an elementis Arthur is quite daring for a warrior, some would even call him reckless. He constantly rushes into combat, and does daring and dangerous techniques. But he always seems to come out unscared. Other than that he is a warmhearted, caring, loving person. He is protective and stubborn, but sees no problem with neither. Thinks highly of his own fighting skills. While not a race so to say, on its own, an elementis is an Elemental that have taken another race as host. In this case the elemental have taken a human host, most common host type. Elementises live longer than their normal race would, increasing their lifespand by up to 1000%. The elemental helps the host with it's magic abilities, making elemtis mages extremly powerful. If the host doesn't have inept magic abilities, the elemental will make the hosts senses and reflexes stronger. In extremely rare occourences both. The host however becomes weak to poisens and grow a more daring personality as time passes. The host process can begin as a potential host reaches the teens. If an elemental finds the potential host to it's liking it will either forcefully possess the host, or ask politely. Once possessed the host remains itself, but finds that part of it's mind is now merged with the elemental. Position: 2nd in command of the Silverwings Militia. Head Mage of the Silverwings Militia. Her position means that she teaches the recruit mages of the militia, and ensuring not nothing too dangerous get conjured inside the base. As a side job she helps keep a small barrier around the base. Bio: Pandora was born as the youngest child of her family. They lived poorly on the edge of the empires borders. She spent her childhood like the others, playing with the others, learning household duties, cooking with her mom. But one day when she were 8, her life changed. An orc clan raided her village, enslaving most, killing the rest. Her mother was taken together with all the other women, it was the last she ever saw of her. Being a slave she mined ore for the orc. That was only the first years. Her brother was sent into a deathtrap the orcs had made, a slave fighting ring. The orcs told her that if her brother died, they'd have their way with her. But Arthur kept winning, and winning, and winning. This went on for years, until the orcs grew tired of waiting. She had just recently found out that she possesed magic abilities, and the orcs wanted to get rid of her soon as possible. But using a broken sword Arthur kept them back. Suddenly he seemed to change, and was able to kill the orcs, leading her to safety. According to him an elemental had taken his body as a host body, whatever that meant, and the elemental called itself Ignis. In honor of this elemental they renamed themselves Arthur and Pandora Ignis. The two searched protection at the elven king, who complied for a while. Pandora was about 18 years old by this point. Whilst they lived with the elves, Pandora was randomly contacted by an elemental, which asked her if she would allow herself to be a host for it. She complied, seeing as her brother had done the same. Afterwards her magic began taking off. It grew stronger day for day, and she quickly learned how to cast even difficult spells. Sometime later Arthur proposed that they went to the capital for work, the elven lands had grown boring, and they felt reckless due to the peace. She complied. But in the capital city the same problem arose. And refusing to wear the military armor, they couldn't get in the army either. Personality: Pandora is, like her brother, reckless and daring. She uses some quite dangerous magic, but always manages to not screw up. She is however, quite lazy, but warm hearted. She is also quite a tease and flirt. Flirting with young men to trick them to free drinks. Her magic can get out of hand. Never mind that in the pictures Arthur seems to be using magic. Last edited by Fluffking on Wed Dec 06, 2017 3:44 pm, edited 1 time in total. No the pic to Arthur is right. Arthur has long hair and breasts? Isn't that just the jacket waving?